North Korea's successful rocket launch on Wednesday was the result of 40 years of investment in the arms industry, experts say. The North began pouring its national resources into developing its weapons in 1966 following the second Workers' Party conference, which led to an official decision to pursue defense and economic development in tandem. Close to a million people work in North Korean arms production, according to unofficial estimates. The regime takes special care of them by giving them priority in food rations. "The families of people working for in arms production got food rations even during the worst famine" in the mid to late 1990s, said one North Korean who defected in 2005. North Korea plucked the elite among students from top engineering schools such as Kim Chaek University of Technology and Pyongyang University of Science and Technology and put them to work at various research institutes to develop weapons. The leading institute is the Second Academy of Natural Science, which is the North Korean equivalent of the South's Agency for Defense Development. The North has some 3,000 missile experts alone, according to one military source here. Pak To-chun, the party secretary for munitions, Ju Kyu-chang, the director of the party's Machine-Building Industry Department and Paek Se-bong, the chairman of the Second Economic Committee, are the leading officials in arms development. 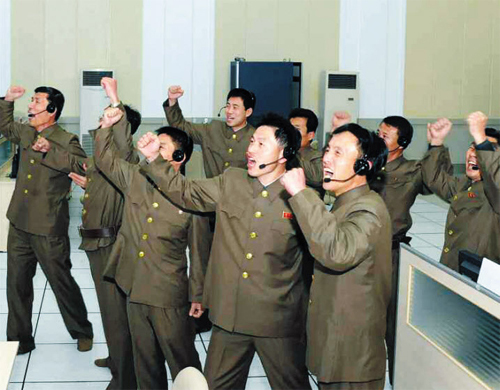 They are sometimes referred to as North Korea's "missile troika." Pak became secretary for munitions in 2010 when Jon Byong-ho, considered a key player in the North's arms industry, retired.